“Even though I have cash on me it’s not convenient to get it when I am carrying a lot of bags,” said Yang, 25, clutching plastic bags filled with pears, potatoes and watermelon. 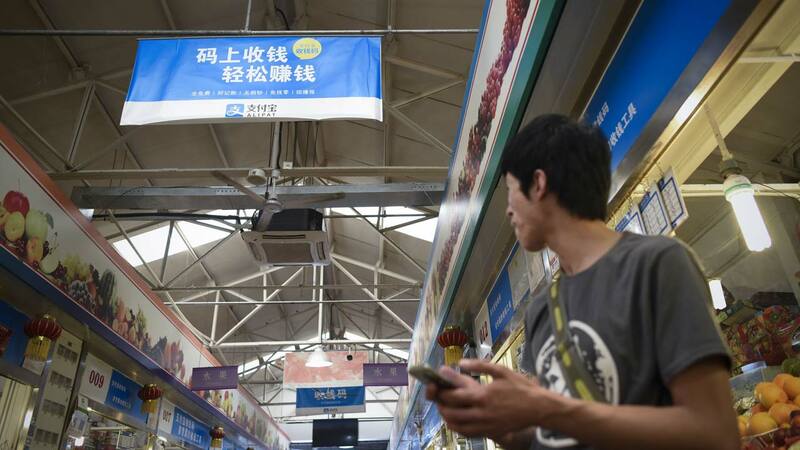 The gross merchandise value of third party mobile payment rose more than 200 percent to 38 trillion yuan (about $5.6 trillion) in 2016 from a year earlier, according to China-based iResearch. The growth of the cash-free system has been supported by China’s rapidly expanding e-commerce market as Chinese shoppers increasingly shun bricks and mortar stores. “I think it’s really very possible that China becomes the first or one of the first cashless societies in the next decade,” said Ben Cavender, a director at China Market Research Group. Cavender estimates China’s mobile payment market is already 40-50 times larger than the United States. Alipay, started by e-commerce giant Alibaba and now owned by its affiliate Ant Financial, and WeChat Pay, which is built into Tencent’s popular messaging service, have hundreds of millions of users between them and are China’s dominant payment platforms. At the fresh produce market, stallholders display barcodes on tables laden with fruit and vegetables for customers like Yang to scan — though many shoppers appeared more comfortable with cash. “People at my age don’t dare to use it,” said a woman in her 50s. Mobile accounted for eight percent of the total value of retail payments in 2015 and is expected to reach 12 percent in 2020, according to a report published in April by UN-backed Better Than Cash Alliance. But cash is still king in China — although less so than it used to be. The Better Than Cash Alliance expects cash’s percentage of the value of retail payments to fall to 30 percent by 2020. It stood at 61 percent in 2010. A key attraction of mobile payment is convenience. People can carry little or no cash and avoid the problem of their debit or credit card being rejected due to the limited number of point-of-sale terminals in stores. China’s relatively short history of using bank cards also makes consumers more open to new technology, said Martin Utreras, vice president of forecasting at eMarketer. “In China a lot of people never had any financial instruments that were automated in any way and the first thing they had was mobile payment,” he said. She prefers cash but accepts mobile payment because some customers do not carry real money. “Cash is more convenient for me because I’m getting older and have bad eyesight,” she said, standing next to her bright-coloured ornaments neatly displayed on the ground.